With a nickname like the “show me state,” you can bet that Missouri takes great pride in the number of recreational opportunities it offers, including a superb collection of exciting and often challenging mountain bike trails. Located in the Midwestern heartland of the country, Missouri, which boasts 114 counties and the large independent city of St. Louis, is the 21st largest state by total area and the 18th most populous state in the union, with the densest populations residing in the cities of St. Louis, Kansas City, Springfield, Columbus and Jefferson City, the state capital. Completely landlocked, Missouri shares borders with eight different states, including Iowa, Illinois, Kentucky, Tennessee, Arkansas, Oklahoma, Kansas and Nebraska. From a mountain biking standpoint, Missouri is a state with miles upon miles of rolling, undulating plains, and many large river bluffs along the Mississippi, Missouri and Meramec Rivers. Some of the most difficult rides can be found in the state’s Ozark Mountains, where grueling climbs are a part of nearly every course. In the following article we will showcase five of Missouri’s most popular and well-ridden trail systems, and provide a brief description of each of these courses. Located in the town of Highlandville, Missouri, Two Rivers State Park is an oasis for mountain bike enthusiasts. Here riders will find a purpose-built, multi-use trail system with nearly 8.5 miles of rugged Ozark terrain to enjoy, all set in a 400-acre park that sits just off the confluence of the breathtaking Finley and James Rivers. The many trails at Two Rivers Bike Park feature mostly natural surfaces and offer the thrills and chills of climbing and exciting descents, and the challenges of drop sections, rock features, built-in curved walls, and other optional stunts. To ensure that every rider can find what they are looking for at the park, the trail system was purposely designed to accommodate a wide range of riders. Beginners, families and leisure seekers will enjoy the 1.5-mile trail that is mostly flat and wide, while intermediate and advanced cyclists can test their nerve on the 5-mile and 7-mile trails, respectively, the latter of which should only be attempted by those with great bike handling skills. Two Rivers Bike Park is the initial offering in the “30 and 3” initiative, a goal first proposed by the group Trail Spring, which will ultimately bring 30 miles of professionally designed single track to the Springfield, Missouri area within just 3 years. Like Two Rivers Bike Park, the additional trails that will be built through the “30 in 3” initiative will attract visitors from all over the Midwest and beyond, creating added tourism and pumping cash into the regional economy. Swope Park trail is an advanced (black diamond) rated course situated in the large city of Kansas City, Missouri. The expertly-built trail traverses mostly rocky and root-filled terrain along the hillside of the well-visited Swope Park. Given its location in the American heartland, the difficulty of this course may be difficult to fathom, but according to locals, the Swope Park trail is one of the most challenging courses in the entire state. A mostly “natural terrain” course, the Swope Park Trail consistently draws some of the region’s most experienced cyclists—riders looking for a competitive-level course that will help improve their overall fitness while simultaneously providing a whole series of bike-handling challenges. Riders who opt to tackle the Swope Park Trail will encounter a couple of very steep hills that will test their leg strength and endurance, followed by some truly wild descents that will help bolster their flexibility and coordination. Throughout this gem of a course, riders will be consistently tested by the track’s many obstacles, including jutting roots, rock gardens, manmade bridges and jumps. And like most of the courses in Missouri, cyclists will find no shortage of beautiful forest scenery here, particularly in the late spring and early summer when the park is exploding with color. It’s no secret that Missouri is a generally flat state in terms of its topography, but it also includes an abundance of rolling plains, making it a great state for beginner/novice riders and family groups. And that is exactly the crowd that is attracted to the Stockton Lake Multi-Use Trail. Inexperienced riders will thoroughly enjoy the Stockton Lake Multi-Use Trail. Located in the town of the same name, the Stockton Lake Trail is a 2-mile course that is rated “beginner” in terms of difficulty. This fun little course traverses some very scenic wooded terrain as it makes its way around the peninsula on which Stockton State Park is located, providing some great views of the lake and a very shady and comfortable ride. Double track courses such as the Stockton Lake Trail are very wide and flowing by definition, allowing riders to pedal alongside each other as they enjoy the majestic Missouri countryside. This does not mean, however, that the trail is completely devoid of some interesting and somewhat challenging obstacles, such as rocks, small roots and a few upraised portions of the course that can make pedaling a bit more difficult. The course is open year-round except for periods of inclement weather, and groups that want to make a weekend out of their Stockton Lake mountain biking experience will find camping just up the road from the primary trailhead. Located in the small town of Steelville, Missouri, the 24-mile Berryman Trail is one of the more popular courses in the state. Situated in the Mark Twain National Forest in the breathtaking Ozark Mountains, the course offers riders all of the advantages of classic Midwestern mountain biking and a scenic treat for the eyes. A single track course throughout, the Berryman Trail includes every type of terrain imaginable, from verdant creek bottoms to rocky ridgetops. Riders will pass a cave along the way—a cave that is rumored to have once been the hiding place of the notorious Old West outlaw Jesse James and his gang. The route mixes narrow and challenging descents, rock gardens and twisting, bench-cut single track, as riders make a loop from and to the starting trailhead at the Brazil Creek campground. The ridge-crest portion of the course offers a one-of-a-kind view of Taum Sauk Mountain (Missouri’s highest point at an elevation of 1,772 feet) and the velvety green Ozarks stretching away from the south and west. This is a great place to rest and recharge one’s batteries before heading back into the trees towards the forever-green and lush creek bottoms and the many rugged hollows. 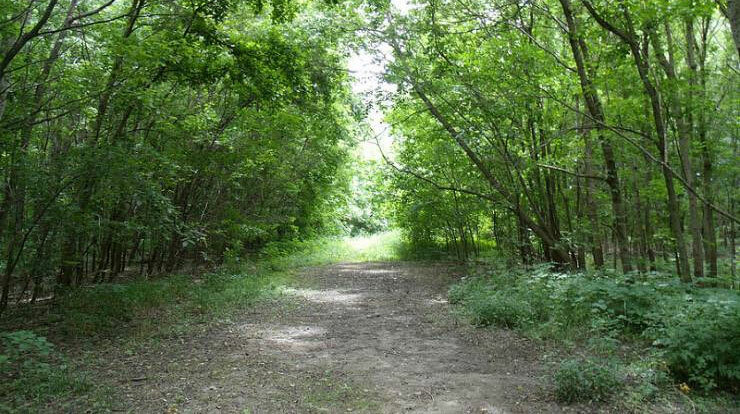 The Berryman Trail is located about three hours southwest of St. Louis, Missouri’s largest city. Last but certainly not least, Matson Hill is a very unique and somewhat taxing, 2.4-mile single track course with plenty of exposed rocks and roots to challenge riders. Located in the town of Defiance, Missouri, some 45 minutes from downtown St. Louis, this fast and entertaining loop course traverses the rolling ridges of Matson Hill and includes a whopping 1,000 feet in elevation gain—and loss. Matson Hill is designed mainly for intermediate riders (and not beginners), but it also serves as a great course for advanced riders and experts looking to get in some much-needed circuit training. The trail is situated in the very heart of Daniel Boone country, where it weaves through a large shady hollow that presents a consistent challenge to the cyclists. The terrain here is very exceptional: mostly wooded, with an abundance of creek crossings. The trail surface is generally dirt in most portions, with several veins of rock, and rocky creek crossings and waterfalls. There is no set direction in which to ride the course. In fact, locals are known to ride the course twice in a single day, once in each direction just to add the challenge.